The European Southern Observatory's Wide Field Imager telescope at the La Silla Observatory in Chile captures an amazing detailed image of the globular star cluster NGC 6362 showing stars both ancient and young within the cluster. There are groups of stars bound together by gravity called globular star clusters. Because of the pull of gravity on each other, these globular clusters form tightly bound spheres with high densities of stars going towards the center of it. A globular star cluster can contain thousands of stars and have been existing longer than some lesser dense galaxies in the universe. In the Milky Way alone, there are around 160 identified globular star clusters with more waiting to be discovered. The Andromeda galaxy is known to have 500 while galaxy M87 has 13,000 globular clusters. Globular clusters are mainly composed of tens of thousands of very ancient stars (running into billions of years old), but they also contain some stars that look suspiciously young. 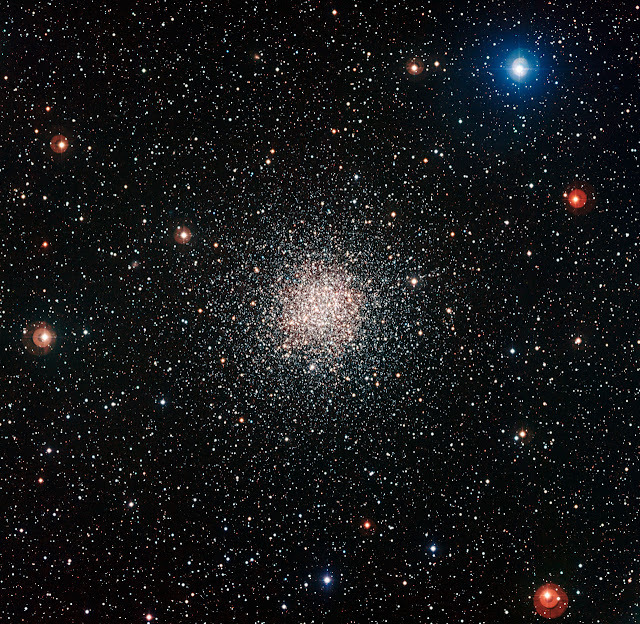 In the image, globular star cluster NGC 6362 shows that it contains yellow stars that have run its course and transformed into red giant stars, but also shows some blue stragglers. Blue stragglers are old stars that look like younger stars. Except that the blue stragglers in NGC 6362 is much bluer, more luminous and more massive than it should be after ten billion years. Blue stars are hot and consume their fuel quickly, so if these stars had formed about ten billion years ago, then they should have fizzled out long ago. How did they survive? Astronomers propose two theories as to the behavior of these blue stragglers and why they look so young: stars colliding and merging, and a transfer of material between two companion stars. The basic idea behind both of these options is that the stars were not born as big as we see them today, but that they received an injection of extra material at some point during their lifetimes and this then gave them a new lease of life. Although less well known than some brighter globular clusters, NGC 6362 holds much that is of interest to astronomers and has been well studied over the years. It was selected as one of the 160 stellar fields for the Pre-FLAMES Survey — a preliminary survey conducted between 1999 and 2002 using the 2.2-metre telescope at La Silla to find suitable stars for follow-up observations with the VLT’s spectroscopic instrument FLAMES. The picture here comes from data collected as part of this survey. The new image shows the entire cluster against a rich background of the carpet of stars in the Milky Way. The central parts of NGC 6362 have also been studied in detail by the NASA/ESA Hubble Space Telescope. The Hubble view shows a much smaller area of sky in much greater detail. The two views — one wide-angle and one zoomed in — complement each other perfectly.